Hugo was in 2nd grade last year at ER Taylor Elementary School in San Francisco. He was a shy, sweet student, but was considered difficult to work with by his teachers because he had so much trouble focusing on his work. He was unsure of himself in the classroom and he needed constant reassurance. Young Audiences of Northern California brought a visual artist into Hugo’s classroom for a 10 week residency. 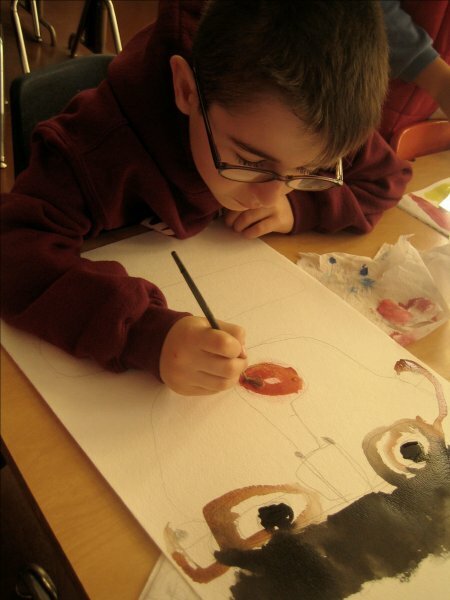 The teaching artist created a safe environment, a perfect balance of structure and freedom. Hugo grew to understand that in this studio there were no “right” answers, and he could edit his work or throw it out. In essence, Hugo was encouraged to fail and try again and he began to work independently. By the end of the sessions, Hugo was raising his hand, talking about his work, making distinct choices with his materials, and he was proud of his achievements. He said to the teaching artist, I want to be an artist when I get older. Whether or not Hugo decides to become an artist he will carry the confidence, decisiveness and courage he discovered during the residency into the other areas of his life.